The Los Angeles Rams are your 2018-2019 NFC Champions, and they achieved that goal in controversial fashion. After a non-call on a third-down pass to TommyLee Lewis, quarterback Jared Goff led the Rams down the field for a game-tying field goal that sent the two teams to overtime. After a Drew Brees interception, the Rams eventually emerged victorious and are heading to Atlanta to play in the Super Bowl. Despite the controversial call, it’s hard to argue against the Rams being the best team in the NFC this season. After winning 13 games with their only losses of the season coming against three playoff teams (Saints, Eagles, Bears), they have proven they can go toe-to-toe with any team in the league. Now, the Rams will have to take on the greatest dynasty in sports; the New England Patriots. For the Rams to win their second Super Bowl in franchise history, they will need to do it as an underdog in Atlanta against the greatest coach and quarterback of all-time. For fans of NFL betting looking at the Rams and Super Bowl betting, here are some best bets to consider. According to 888Sport, the Rams are currently 2-point underdogs to the Patriots, but that line has moved a bunch in the 24 hours since the matchup was set. Be sure to keep an eye on this line over the next several days as it is likely to keep on moving as the public bets on the game. 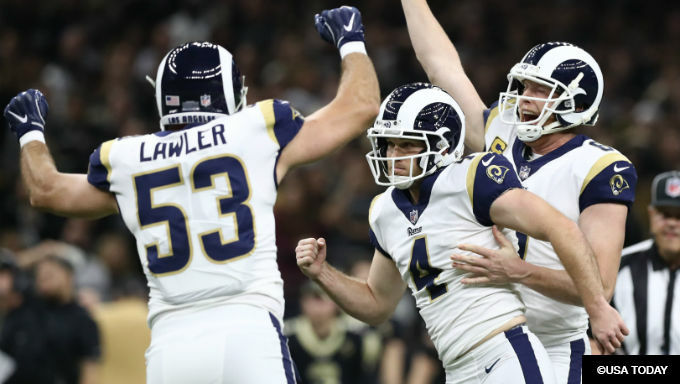 Despite being big favorites for most of the year, don't count out the Rams from covering and winning this game as that is precisely what they have done in their last four games. Bet the Rams +2 with 888Sport. Considering that most games are decided by more than two points, the Rams money line is a pretty solid bet. As mentioned before, the Rams have proven to be one of the best teams not just this year, but over the last two seasons. No team in the NFL has more wins in the regular season than the Rams since the start of the 2017 season (24). While the Rams don’t have the Super Bowl experience that the Patriots possess, they are the more talented team as they finished No. 2 overall in DVOA in 2018. With multiple All-Pro players on both sides of the ball for the Rams and arguably one of the smartest head coaches in the league, getting the Rams’ money line at +110 is a steal. Don’t be afraid to take the Rams moneyline instead of getting two points. The 57.5 over/under set by top NFL bookmakers is the highest Super Bowl total of all-time , just edging out Super Bowl LI at 57. Not only is that the highest point total in Super Bowl, but it’s also one of the highest for a playoff game, as well. Bettors are fully expecting this to be one of the highest scoring games of the Super Bowl. Oddsmakers have a pretty good grasp at setting the over/under in Rams' games in 2018. In their 18 total games this season, the Rams (and their opponent) have gone over the point total in nine games. New England, on the other hand, has exceeded the point total in just seven of their 18 games. Despite the two great offenses, be wary of betting the over in this one. In the last 10 Super Bowl games, the total has gone over just three times. These are indeed two of the best offenses in the NFL, but don't be surprised if this is a 24-20 type of game. Bet the under with Betfair. What are the odds Jared Goff wins Super Bowl MVP? Jared Goff is +235 to win Super Bowl 2019 MVP, the second choice behind Tom Brady (+110). You can bet on virtually any non-offensive lineman for the Rams to win the Most Valuable Player award in Atlanta. However, there are a few odds that stand out more so than others. Let's start with quarterback Jared Goff, who is +235 to win the award. He has the second-best odds to win, with just Tom Brady ahead of him. It's reasonably likely that if the Rams win this game, it will be on the back of Goff. However, betting on Goff is risky because he hasn't been great in the playoffs. For his career, he has a passer rating of just 78.9 in three playoff games. Considering Goff's shaky playoff history, there are better bets on the board for the Rams. Pass on this one for a few bets with more upside. The key to the MVP race on the Rams side of the ball is figuring how who is going to get the lion’s share of the work on the ground. Against the Saints, Todd Gurley received just five total touches as backup C.J. Anderson carried the ball 16 times. Gurley is +1800 to win the award while C.J. Anderson is at +2200. Expect the Rams to try to run the ball early and often against the Rams and the leading rusher to get some MVP consideration with a win. If you are feeling bold, grabbing Aaron Donald at +2500 with 888Sport is a fun bet to make. If the Rams want to win this game, they will need to get sack Tom Brady. That is easier said than done as he has yet to be sacked in this playoff. If Donald can have his typical type of game in this matchup and keep the Patriots under 24 points, Donald should get some MVP consideration. Getting the best defensive player in the league at 25-to-1 odds is never a bad bet. Assuming Gurley is healthy, he is a lock to score a touchdown in this game. Gurley played in 16 total games this season (including the playoffs), and there were only two instances (at Chicago and vs. Kansas City) where he did not reach the end zone. At 888sport, Gurley is -139 to score a touchdown in this game. Despite the odds, this is a pretty safe bet, especially when you factor in that Gurley will have two weeks to rest up for the game. Gurley is +375 to score at least two touchdowns in this game, and that isn't a bad bet either as he did that six times during the regular season. Another touchdown prop bet that I like is Brandin Cooks to score at +115 with Karamba. While Cooks hasn’t been a big scorer for the Rams this season (six total touchdowns), I like him to score against his former team in the Patriots. In a game that is expected to have a lot of scoring, it’s not unreasonable to think Cooks will see quite a few opportunities to reach the end zone in this one.